Add multiple tasks to milestone? 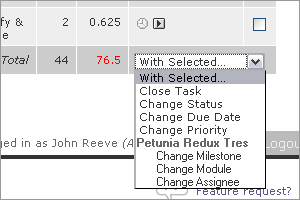 I know that from the Milestone detail page, I can choose a bunch of tasks to add (from a long list of tasks). But it is awfully hard to remember / select tasks from a long list. From the main task list, is it possible to add multiple tasks to a milestone? It would be great to use all the dropdown filters to identify a bunch of tasks, then add them all at once to a milestone. But the "With selected ..." dropdown doesn't have a "set milestone" option. Regarding adding multiple tasks at once, this is on the development plan and is slated for a little later this year.